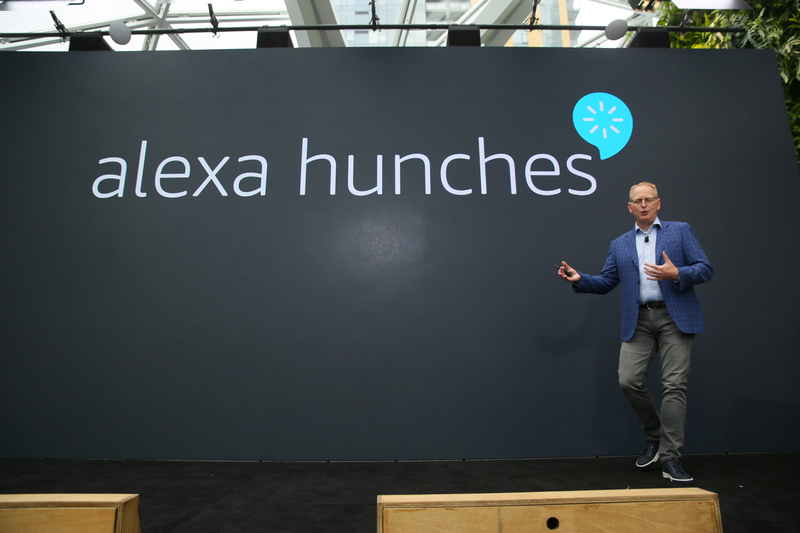 Ooh, nice -- when you add an Amazon Smart Plug to your smart home setup, Alexa asks if you want to rename it, then lets you do so with just your voice. "Call it the bedroom light." That's a new feature, not sure when it'll be available though. That's a great feature, and pretty obvious in hindsight. BTW, the demos are mad funny. Limp is getting a few a little off. He just tried to set up a new Routine via voice, wasn't working. Whoops. First demo fail. "When I say goodnight, play babbling brook"
She starts playing babbling brook. Limp gets flustered and asks her to stop, then tries again. 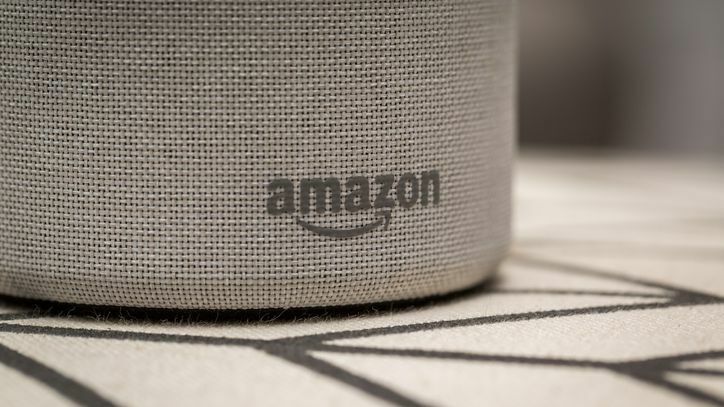 "Alexa, when I say babbling brook... oh that's not going to work." She may suggest things for you, like when you say good night, it'll suggest locking the door for you if you haven't already. 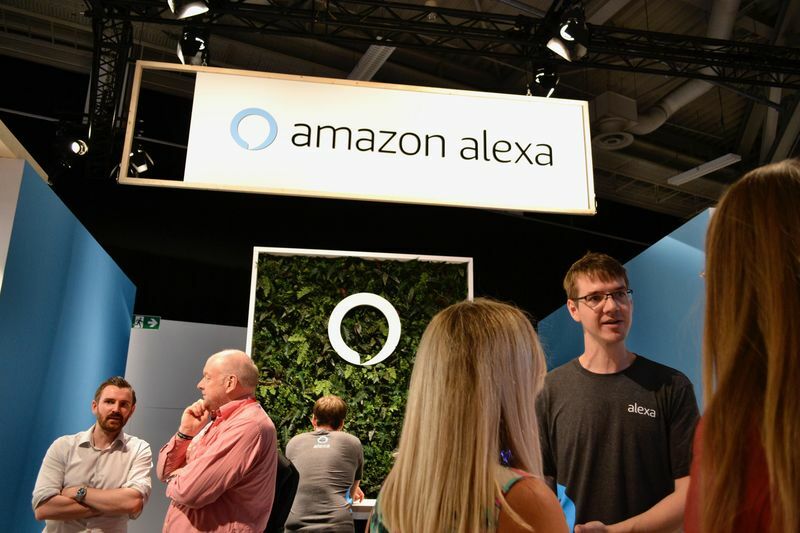 Limp mentions Alexa working with 20K devices now, that was revealed at IFA recently. CNETAlexa's expansion is way up from the 4,000 devices that had it in January. 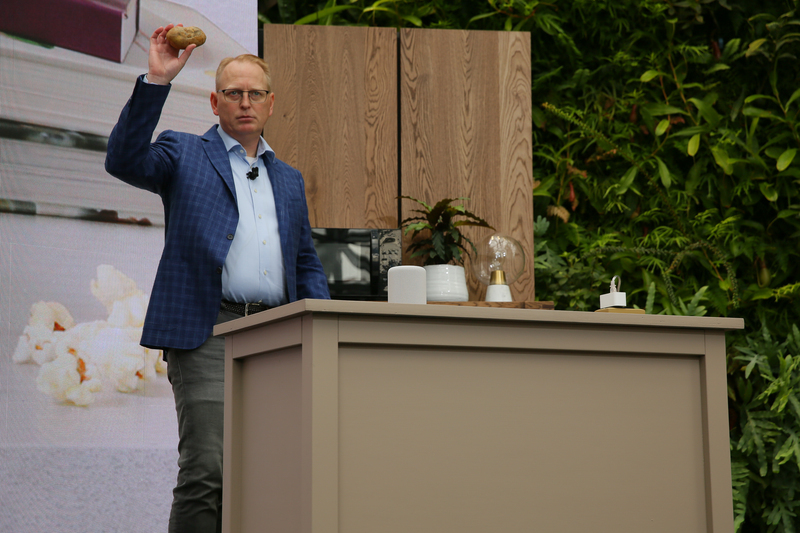 Kenmore, Moen, and Netgear some of the names that have been playing around with Amazon's newest smart home APIs. Mentions Moen's smart shower. 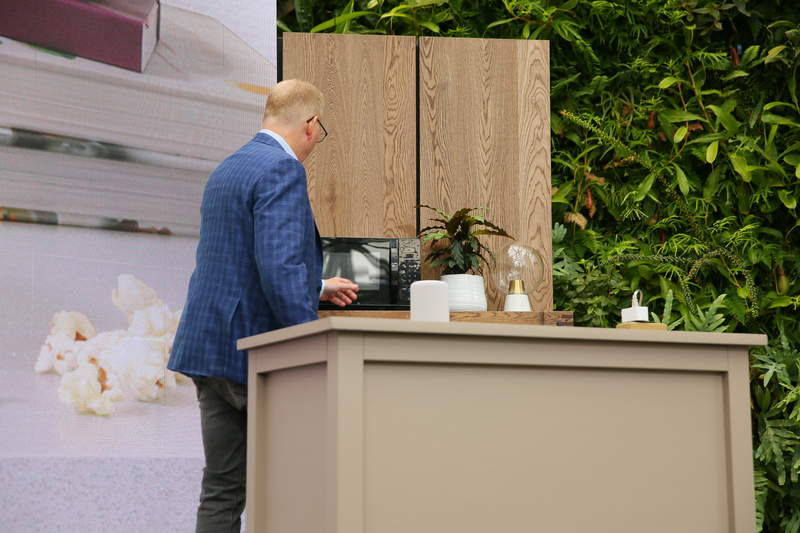 "There are a lot of things that you want to be connected in the house." 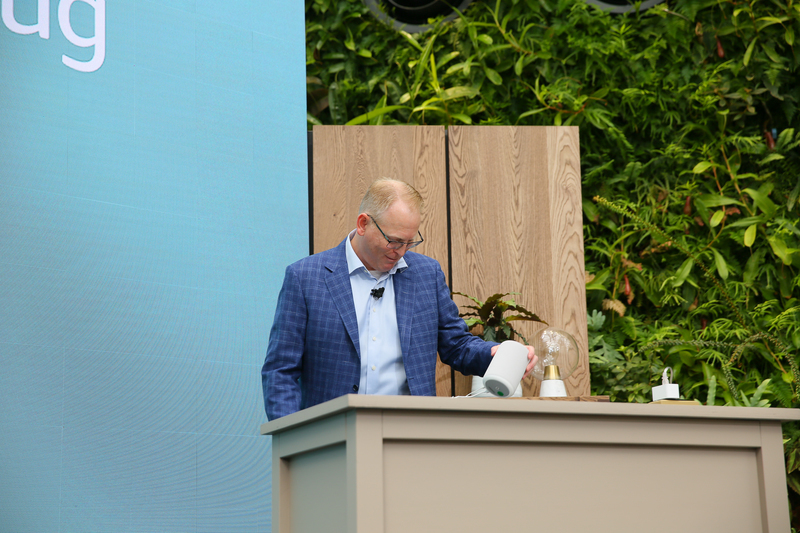 Talking about connected devices in home. "We wanted to help lead the way on that." 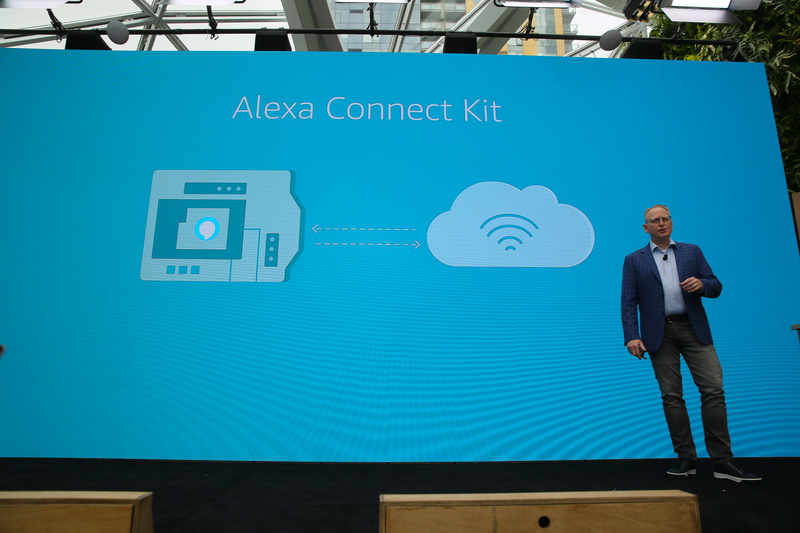 New Alexa Connect Kit, can be integrated into devices and appliances. 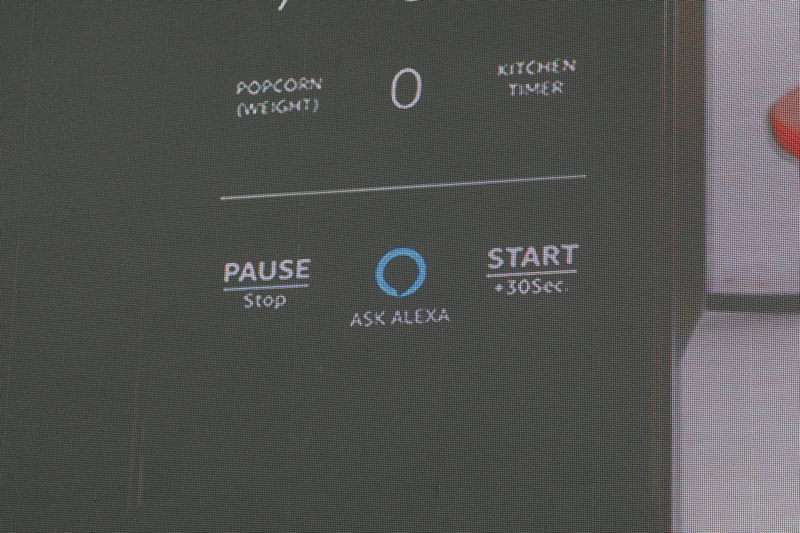 Which brings us to the "Alexa Connect Kit." It's a little module that devices can add to sync up with Amazon's cloud services in a secure, structured manner. "This is a really simple way for devices to get connected." This is a toolkit for developers, not yet another device btw. It's not the microwave. Wait, microwave! "Yeah, it's a microwave." 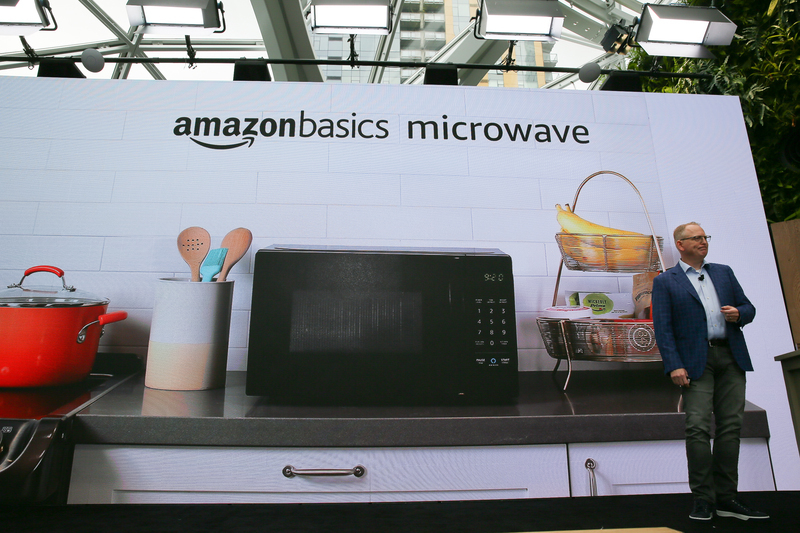 Amazon Basics Microwave. To paraphrase Ian Malcolm: "They did it. Those crazy sons a b*****s, they actually did it." User interface of microwave "still stuck in the late 70s." 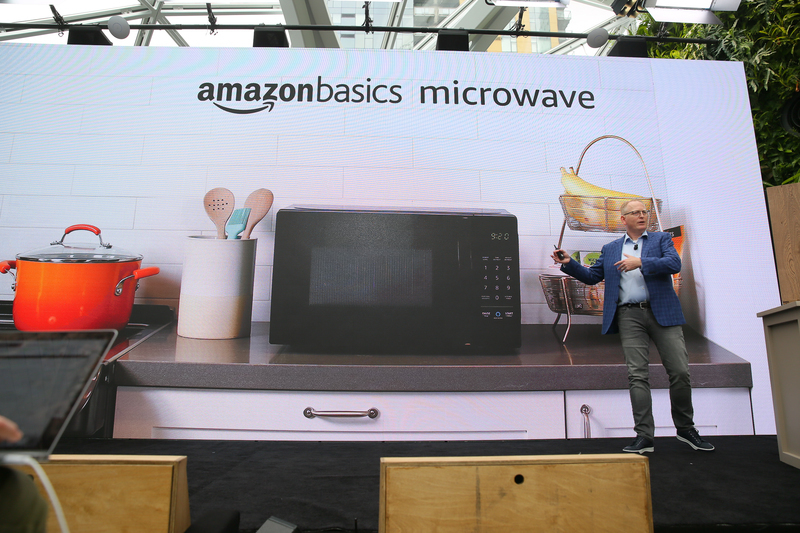 And yep, it's an Alexa-enabled microwave with built-in Dash replenishment. Ashlee Clark Thompson called this one. CNETMy Lean Cuisines are ready for some voice assistance. Not an Echo speaker. It works with one nearby. Works with Dash Replenishment Service for automatic reorders of...popcorn? What? He's turning on the microwave WITH HIS VOICE! 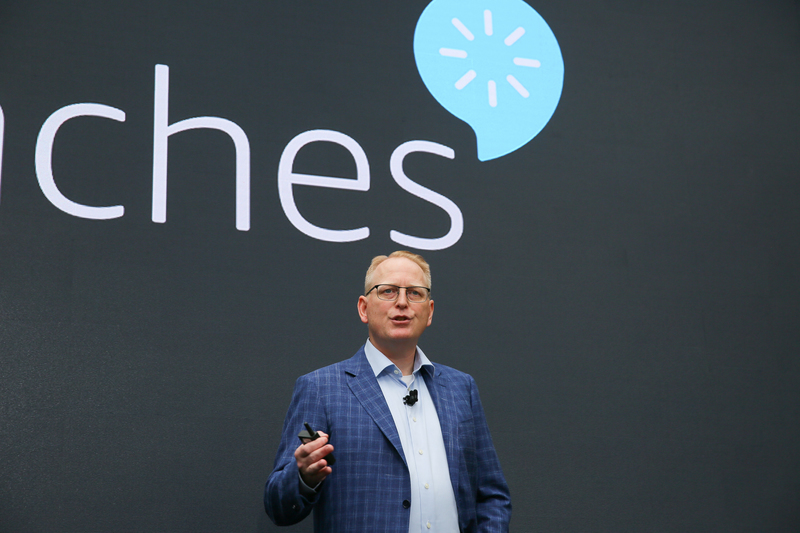 "We think it will lead the way for a lot of people." 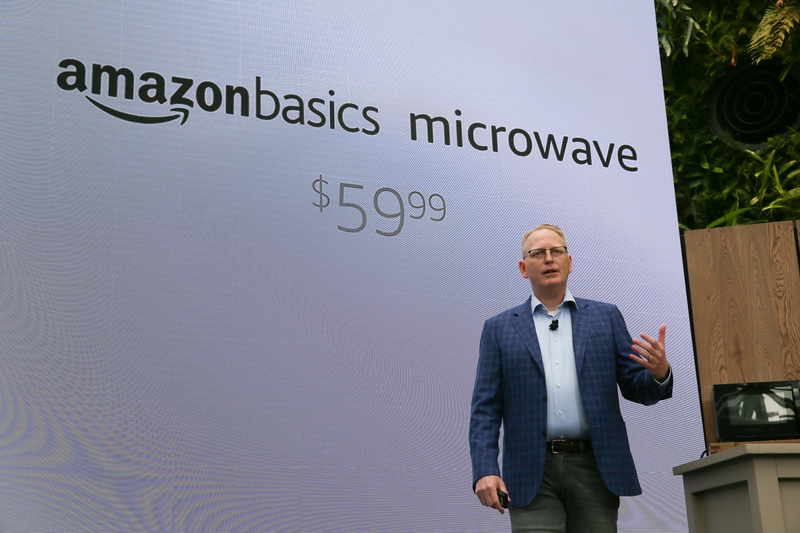 $60 microwave. Geez. Another new device. 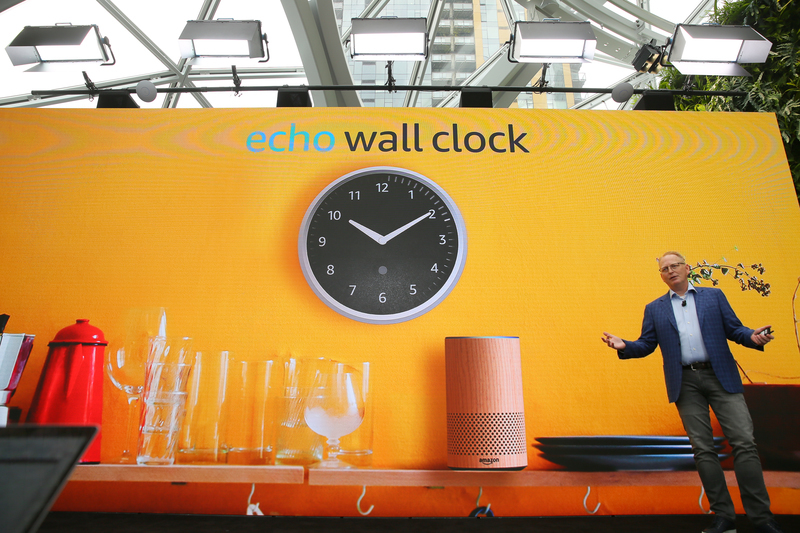 The Echo Wall Clock. 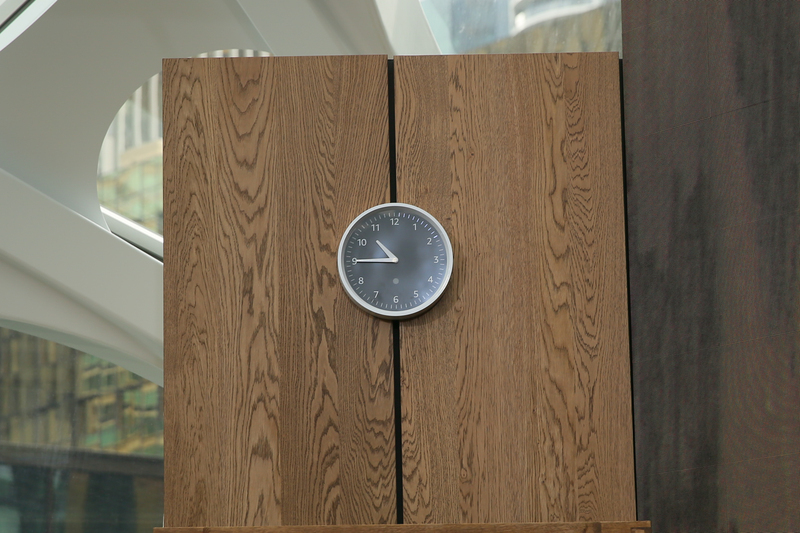 It's literally just an old-school analog wall clock like you might see in a classroom. With Alexa. It's not an Echo speaker, works with Echo nearby to show you timer you set. LEDs around the rim of the clock show your Alexa timers. "You never have to worry about daylight savings time." It changes the time automatically...but he failed to mention that daylight savings is the worst.